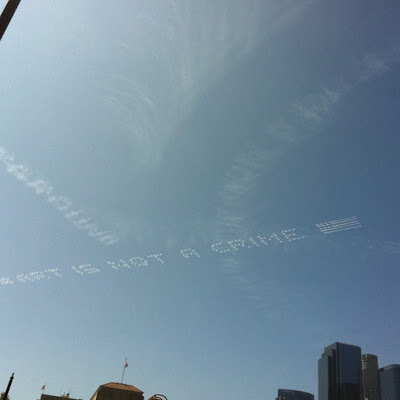 Saber, renowned Los Angeles graffiti artist, has taken to the skies in an attempt to remind the city of Los Angeles that the mural moratorium is ruining Los Angeles' reputation as a mural city ripe with the life and culture of its residents. He posted this explanation of his actions on his blog and I thought it interesting to note that part of the reason the moratorium is being so strictly enforced against public art mural production is that the outdoor advertising industry found itself under fire not too long ago. Without permits for many outdoor commercial signs it seemed that part of the industries method of combatting that enforcement was to drag public art into the discussion. Instead of engaging the conversation of what is and isn't protected under free speech, the city of LA bowed to the industries demands in cowardly subservience to those that sponsor campaigns and fight tooth and nail for the right to take advantage of an unsuspecting public.